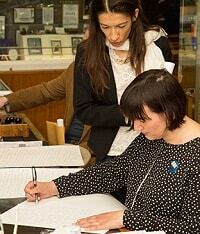 Learn calligraphy at the Pen Museum – beginners and experienced calligraphers welcome. Workshops run 10:00am – 11:15am and 11:30am – 1:00pm. Both workshops are drop-in sessions with no need to book in advance. Please note that these workshops are for adults only. As a result of the workshops being drop-in sessions, there is a slim possibility that occasionally classes are full.